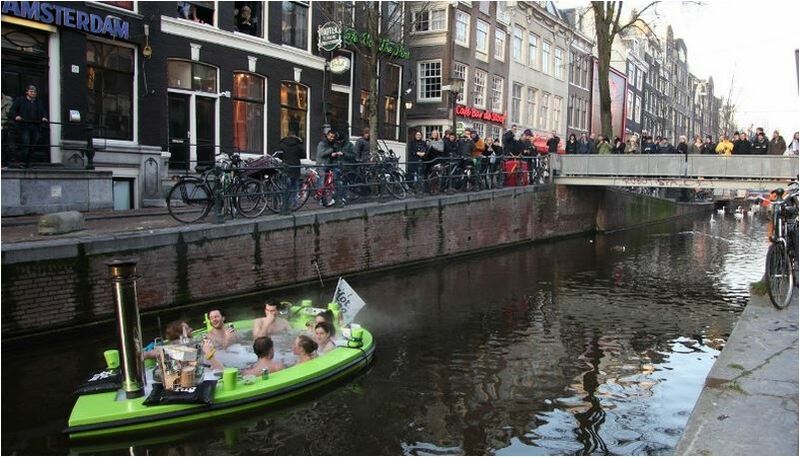 We are very excited to be the first people in Amsterdam with a Hot Tug, a wonderful Dutch-designed engineering marvel that is exactly what it sounds like: a hot tub with a motor. Why sit on a floating tour bus wearing headphones when you can glide along the canals in your bathing suit with a drink? This is the best and most unusual tour in Amsterdam and probably in the world. You can rent a private hot tub boat or split a boat with strangers at 3pm daily. The boat holds six people plus the captain and we go out with a minimum of three people. You are encouraged to order (reasonably priced) drinks from our bar and bring them on board. 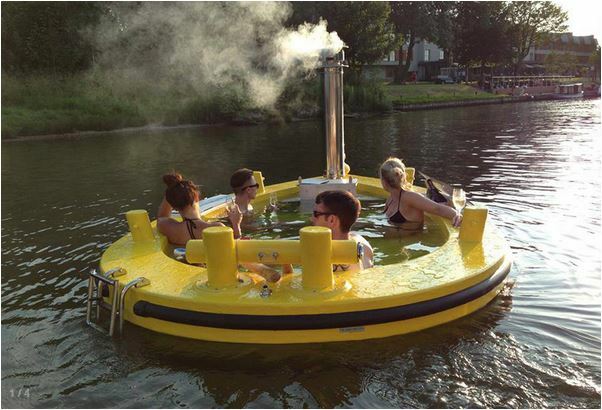 The Hot Tug is a safe and stable, floating wood-stove fired hot tub with an outboard motor. Three hours before the cruise we fill it up with fresh, warm water which is heated by putting wood on the fire. The water temperature is 38 degrees ( 100 degrees Fahrenheit). Is it cold or raining outside? No problem, even in the winter. You are in a hot tub! All you have to do is sit there and soak. If it gets too hot, you can sit on the side. If you want to cool off, you can jump in the canal which is safe for swimming (and peeing). Our captain will drive the boat and navigate the canals from the hot tub. (S)he will talk about the city, but this is not a four-language canal boat tour. Think of it as a boat ride and conversation about Amsterdam with with a friend who lives here. The tour takes 60 minutes although if everyone is having a great time, we can stay out longer. You can see more about the Hot Tug on their website here. . They can also tell you how to order your own and have one shipped to you. What do I bring and where do I change? Bring towels and arrive at Boom Chicago with your swim suits on under your clothes or change in our dressing rooms. The boat is docked five minutes away at a houseboat on the Prinsengracht. Take off your outer clothes at the boat and leave them on the houseboat with your towels. Bring your phones and valuables on the Hot Tug and put them in the waterproof box. Drinks come on the boat too. We return to the houseboat to dry off and most people say goodbye there. If you make prior arrangements, you can return to Boom Chicago to change and shower. Yes and also for children who can swim. No Hot Tug has ever tipped over or sunk. They are stable and you can even stand on the side without making it unstable. The stove that heats the water can be touched without getting burned. In the unlikely event of a collision, keep your hands inside the boat to prevent fingers from getting scraped or jammed. If the boat were to sink, there is a floating safety ring on board (but not life jackets). You are never more than a few feet from the sides of the canals. As with anything fun like this, participants must sign a wavier. Although the captain puts his own phone in the waterproof box too, it is even safer to not bring your phone or valuables at all. We do not take responsibility for your possessions left on the houseboat or that items that come on the Hot Tug will remain dry (although we expect that they will be OK). Anything you bring could be dropped in the canals.